There are many very significant milestones that children go through — their first steps, first words, first day of kindergarten, first day behind the wheel of a car — and each of them can be very exciting and incredibly stressful for parents. If you’re the parent of a 15-year-old who has gotten their learner’s permit and they’re geared up and ready to hit the road, there’s a good chance you’re dreading the thought of them putting their hands on the pedals and hands on the wheel. One great option is to sign them up for private driving lessons with Pacific Driver Education, but even with driver education courses, kids still need plenty of practice time, and they need to be supervised by an adult. So when it comes time to taking them out on the road, how do you stay calm and reassuring? Here are some tips from our ODOT-certified driving instructors. This is obviously easier said than done, but we’re sure you remember the days when you were taught by your parents — no good comes from slamming on the imaginary brake pedal. We also understand that parents can have the best of intentions to remain calm, but things can be different when you’re actually on the road. Have this conversation up front with your new driver, tell them that you’re going to try to remain calm as much as possible. And if things do get edgy, try to keep your voice level and your body language relaxed, any additional stress will only make the young driver feel more uncomfortable. Depending on your teenager’s driving experience, plan a route ahead of time that can still be a challenge, but won’t make them feel uncomfortable or unsafe. If they haven’t driven on a busy highway yet, you might want to start by going down a busier four-lane road with traffic lights, or if that’s still too much, choose a slower residential area with wide streets so they can practice stopping at stop signs and keeping an eye out for pedestrians. But wherever you go, be sure you have written directions and instructions for them to follow from start to finish. Having directions is one thing, but understanding how to direct a new driver is another. For example, use the word “correct” when they have a question about which direction to go, rather than saying “right,” which could be interpreted as “turn right.” Avoid shouting the words “stop” or “be careful” and simply say “slowly brake.” And give them plenty of time to understand the instruction before it’s necessary to make any changes, such a turn. Keep in mind that they will pick up on the habits you have as a driver. Having a neutral driving instructor can be incredibly beneficial. Possibly the most helpful is that when mistakes happen or things get tense, you don’t have to take those feelings back home with you. Our driving lesson instructors have experience staying calm and they fully understand how to provide instructions and critiques that will improve their performance and skill level. 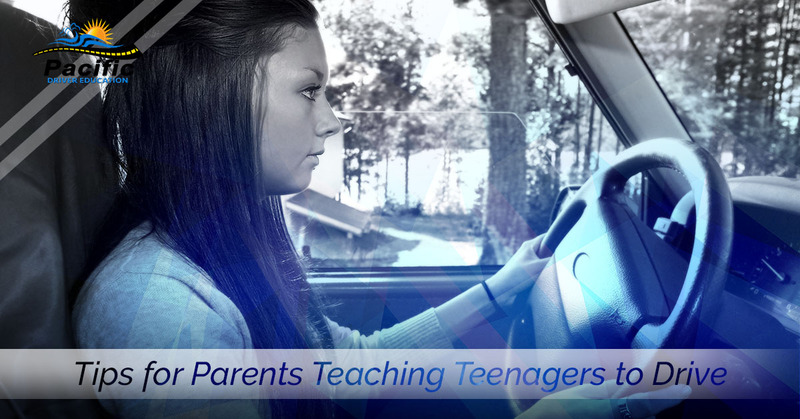 If you want to avoid teaching the biggest driving concepts to your teenager, sign up with Pacific Driver Education for trusted driving lessons.